Portable Perforated Picnic Tables Are Used In High-Traffic Seating Areas In Parks, Campuses, Snack Bars And More. 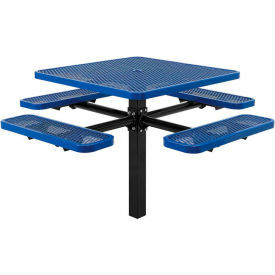 Premium Portable Perforated Picnic Tables are made using heavy-gauge metal with a thermoplastic coating on benches and tabletop. Protective coating provides a smooth, high-gloss surface that stays cool to the touch for comfortable seating in the sun. Thermoplastic coating resists fading, mold and vandalism, and will ensure maintenance-free durability through years of high-traffic usage. Rugged galvanized tubular steel frame is shielded with a powder coat finish for rust-prevention and resilience against the elements. Bench and table corners are beveled for safety. Mounting tabs allow anchoring to ground for stability and security. 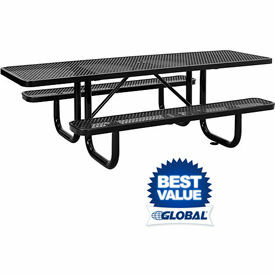 Steel In Ground Mount Picnic Tables Are Durable Seating Solutions For Parks, Public Buildings And Other Outdoor Areas. 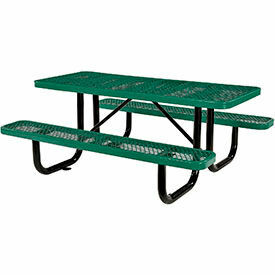 Steel In Ground Mount Picnic Tables are made of high gauge metal for long lasting dependability and strength. Thermoplastic coating protects against elements for outdoor use. Graffiti proof for low maintenance. Available shapes are Rectangular, Round, and Square. Available colors include Black, Blue, Burgundy, Gray, Green, Navy, Orange, Red, and Yellow. Dimensions vary per model. 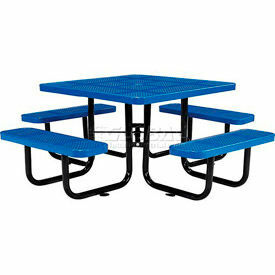 Kids Height Steel Picnic Tables Are Used For Schools, Playgrounds And Other Outdoor Areas For Children. 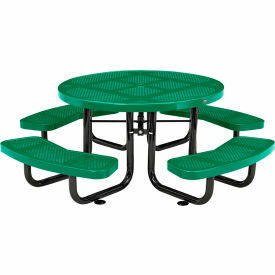 Kids Height Steel Picnic Tables are made of high gauge metal for long lasting durability. Framing is made of steel legs for superior strength. Thermoplastic coating helps minimize maintenance, deter vandalism and withstand harsh weather conditions. Available in Rectangular, Square, and Round. Measurements vary per model. Mount types are Surface, Portable and In Ground. In-Ground Mount allows permanent installation in fresh, wet cement or can be installed in grass or soil surfaces. Assembly is easy. Available colors include Black, Blue, Multi-Colors, Green and Red.